After the flight and attack versions of the Klingon Bird of Prey, the third and final - Landed - option was inevitable. For all intents and purposes it's exactly the same mould that was used for issue 3 and then altered with wings swept down for the later attack edition and both were featured in the run of regular issues. 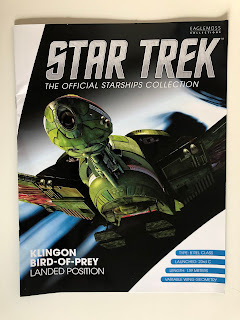 However collectors wishing to complete their trio of Birds of Prey will now need to invest outside of the standard collection as the final Klingon variant has been released as a bonus edition. Truly there's very little to say about this one that hasn't already been said on the reviews of the previous two editions so this might be rocking in as the shortest starships review of all time. What i can say about the service with this one is that while it arrived merely 24 hours after ordering it did arrive damaged but was replaced within 48 hours by Eaglemoss, no questions asked (although I did send some pics through as proof). The swept up wings and landed position is something we've only experienced on this craft twice in The Search for Spock and the subsequent The Voyage Home movies. The detail on the ship body and the upswept wings is absolutely the same as the previous editions and the only new addition is the pair of landing feet added to the bottom of the hull. The tragedy here is that both on the cover of the magazine and on the ship itself there is no indication of where the feet retract into meaning that in both instances it looks like they have been roughly slapped on to the Bird of Prey as a bit of an after thought. Maybe they have but the weighting in the craft is absolutely perfect which means that you can do away with the black base and clear plastic clip and display this model as it was meant to be - on its own two feet. All that's missing is a landing pad at the foot of Mount Seleya. The detail on the Bird of Prey itself is faultless on the upper side with the same weathering effects in full bloom but the bottom does leave a little to answer for and not just because of the "add-on" landing gear. It's still a bit too clean and empty of features that goes right against how the rest of this classic ship looks. If you do compare you might be able to tell there's a bit more dirt on the bottom of this one but not by much. 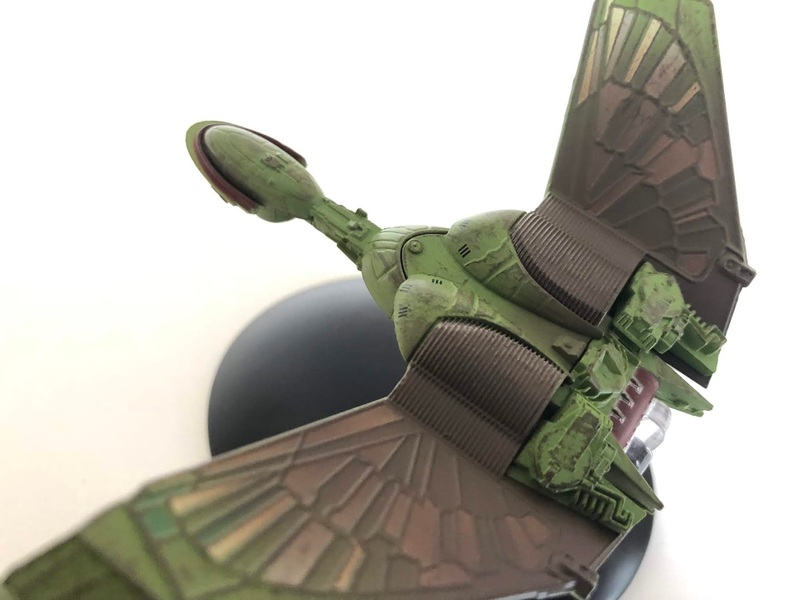 It's 100% a completist ship with only the wing positions of the three variants being different and as of time of writing you can now buy all three options in one handy box. This is one that fan demand...demanded...and got and rightly has ended up as a special rather than a regular issue because subscribers might have been a little narked to pay for this one again after the cruise and attack position variants dropped in. Note too that the issues with the detail on the folding front plates of the wings have still not been resolved either even after several email conversations with Eaglemoss directly. The magazine is actually a really good piece of reading even if you do think the Bird of Prey cash cow has been milked dry. Giving a skant overview of the already extensively covered ship, we move into The Great Bird of the Galaxy which covers the design and creation of the craft for The Search for Spock and includes some early storyboard and sketches of what could have been. Also in here we have photos from the original build and photography work that was done of the Bird of Prey for the third Star Trek movie. 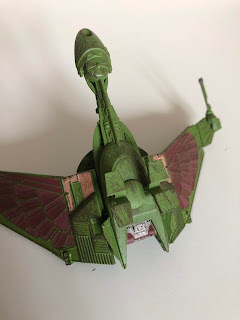 Inside the Bird of Prey talks about - and shows - what the interior of the ship might have looked like as well as explaining why the bridge ended up looking the way it did plus some background to Lord Kruge's snarling pet. There's a brief - but good - segment on the creatures created for the Genesis Planet as well as how Kruge's death was filmed before closing out the bonus magazine with the imagining of landing the Bird of Prey in The Promised Land. It's a magazine well packed with information about the well-used Star Trek ship and how it made it to the screen. Definitely one of the best and most impressively illustrated volumes to date in the collection as a whole. Final Tease for Season Two?